Gyptone BIG Curve Panels are engineered to create highly curved ceilings without breaks or grids and save the cost and time of custom fabrication. At 6.5 inches thick, the product can be dry bent to a 10-foot radius and wet bent up to a 5-foot radius. 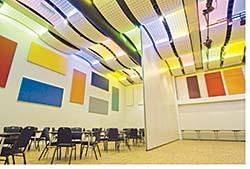 Panels, fitted with acoustical backing tissue, come in modular 2,400 mm-by-1,200 mm sizes.